Did Dark Matter Kill the Dinosaurs? In 1908, an object that may have been an asteroid or a comet exploded a few kilometers above the river Tunguska in the forests of Siberia. The blast was a thousand times more powerful than the bomb dropped on Hiroshima; the wave from the explosion went three times round the world, like Superman turning back time. It could be heard by people “living at a distance as far away as France is wide”. Windows shattered in a village seventy kilometers away. Two thousand square kilometers of forest were razed. It’s estimated that this exploding bolide (an object from space that disintegrates in the atmosphere) was maybe fifty meters wide. This impactor would have been an object the size of a major city moving 500 times faster than a vehicle on an autobahn… To put it in some perspective, an object of its size and speed would have released an energy equivalent to up to 100 trillion tons of TNT, more than a billion times greater than that of the atom bombs that destroyed Hiroshima and Nagasaki. Yep, it’s curtains for the dinosaurs. In fact, as Lisa Randall reveals in her gripping account of the Cretaceous-Paleogene (K-Pg) extinction event (the DeLilloan “event” is delicious), it would appear that nothing larger than about twenty-five kilos — a midsize dog — survived the impact. Acid rain, an atmosphere darkened by sulfur, heavy metal falling from the sky: it’s about as apocalyptic a scene as one can imagine. 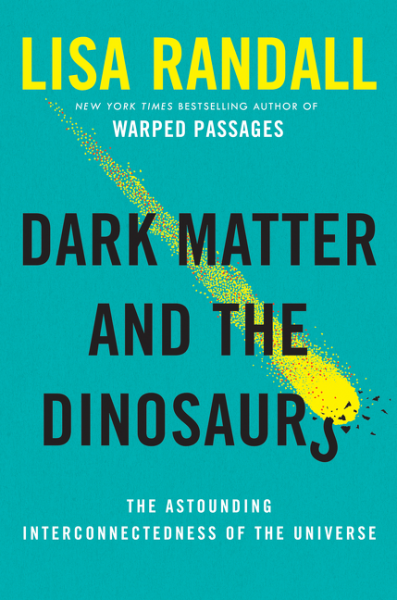 Randall’s mind-blowing new book, Dark Matter and the Dinosaurs, has a brilliant hook. Could there be a connection between the ominously (though misleadingly) named dark matter and the K-Pg extinction? Randall, a particle physicist and cosmologist at Harvard, leaves this question dangling, tantalisingly, for much of the book’s duration as she sets up the theoretical framework to support her playful but audacious suggestion. Based on current scientific evidence, we believe that dark matter comprises some eighty-five percent of the universe. Billions of dark matter particles pass through us every second. Despite this, it cannot be detected, merely inferred — usually by its gravitational effects on visible matter or through gravitational lensing (the phenomenon of light bending around large objects). It appears not to interact with visible matter or electromagnetic radiation in any way. Yet in high enough concentrations, its impact can be huge. Indeed, in Randall’s eloquent early chapters on the evolution of the universe, we learn how the presence of dark matter was essential to the formation of structure in the universe. “Perhaps one can say,” she muses, “that physicists studying ‘the dark’ are participating in a Copernican revolution in a more abstract form. Not only is the Earth not physically the center of the Universe, but our physical makeup is not central to its energy budget — or even to most of its matter.” If she and her collaborators on Dark Matter and the Dinosaurs are correct in their studies — which suggest that the influence of dark matter in the Universe could have a decisive say in the future of the Earth — it would be a revolution in human thought every bit as gargantuan as that precipitated by Copernicus. Randall’s theory is that there’s this huge disk of dark matter lodged in the midplane of the flattish disk of the Milky Way that has a sort of tidal effect on the unstable comet material bobbing along at the edge of the galaxy in the so-called Oort Cloud. Periodically, in sync with various orbital rhythms (namely the passage of the sun through the midplane of the Milky Way), this has caused said comet material to hurtle through space in our general direction. There is evidence to suggest that the five major extinctions thus far identified in the ancient history of our planet map on pretty exactly to the periodicity that this dark-matter theory supports. Occam’s razor, the principle that the simplest explanation is usually the rightest, crops up several times in the course of the book only to be (quite rightly) pooh-poohed. After all, Randall’s theory relies on the work of geologists, physicists, biologists, philosophers, chance — and, it turns out, even the offhand comments of taxi drivers. Much of the book is devoted to the incredible scientific endeavor that has gone into identifying and dating craters on a planet where climate’s done its best to destroy the evidence; the awesome human ambition behind the experiments in the Large Hadron Collider at CERN that are currently trying to identify the stuff of dark matter; and the work done by generations of evolutionary biologists to uncover the secrets of the origins of life on Earth. Our best science is put into service by Randall and her collaborators in this book, and while the result is far from straightforward, what may seem to the lay reader pretty absurd going in ends up looking pretty convincing coming out. The book’s subtitle gives it away: what happens in the farthest reaches of the galaxy does indeed seem to be astoundingly closely connected to goings-on here on terra not-so-firma. It’s a complicated theory, sure, but as Randall writes, “The beauty of the scientific method is that it allows us to think about crazy-seeming concepts, but with an eye to identifying the small, logical consequences with which to test them.” As the saying goes, from tiny perturbations in the Oort Cloud great explosions do grow. Or something like that. 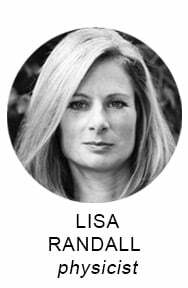 Lisa Randall will appear at our next Seriously Entertaining show, Happy Now?, on November 11, 2015, at City Winery NYC. You can buy tickets here. We print our postcards at 4over4.com.